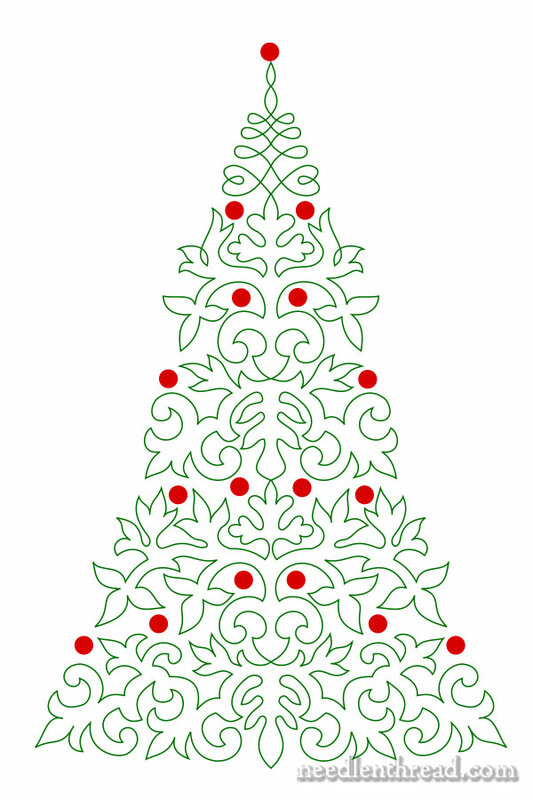 If you’re looking for something Christmassy to embroider, something relatively simple that will work up quickly and look great, you might like this Christmas tree embroidery pattern. Inspired by a soutache embroidery design from a late 1800’s publication, this particular pattern is especially suitable for tambour embroidery or for couching. If you start from the tip of the tree and follow one line as it twists and turns, you’ll eventually end up back at the tip of tree! Once you have the tree part embroidered, you can add ornaments to it, too, which doubles the fun! 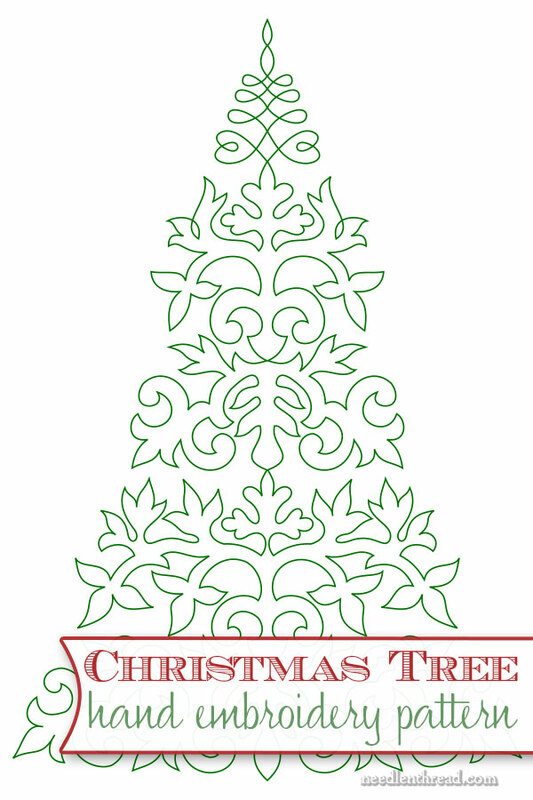 Below, you’ll find the free Christmas tree embroidery pattern in PDF format, as well as some suggestions for stitching. Soutache is a kind of embroidery that involves couching braids or cords onto the ground fabric, so soutache designs are usually continual line designs so that the braid or cord does not have to be cut. Tambour embroidery, worked with a tambour hook, is especially suited to soutache designs, because once you start stitching, you don’t have to stop until you finish the whole design. It’s a great situation! After all, ending threads and beginning new ones continuously can be a kind of drudgery when stitching. Even without a tambour hook, though, the design would work up well in most line stitches. Stem stitch, whipped backstitch, split stitch, regular chain stitch – all of these (and other stitches, too!) would look great! You can fill the tree, too. Outline in one color, fill in another, and sprinkle some ornaments in satin stitch, Rhodes stitch, or even tiny ribbed spider web stitch between the branches. Or don’t fill the tree – just outline it and scatter the ornaments all over it! Instead of stitched ornaments, how about some beads? Specialty beads, seed beads, bugle beads. Any type’ll work! I’d love to give this design a go with my tambour hook. I’ve had the idea on the back burner for a while, but alas and alack! Every time I look up, we’re another day closer to Christmas, and my Hungarian runner is still not finished! So instead of holding onto the design, I thought I’d pass it on to you. Maybe you can do something with it! And of course, you don’t have to limit the Christmas tree to embroidery. It’s suitable for card making, paper crafts, painting. Put it to use in any kind of craft application you like! Here’s the PDF for the pattern. If you choose “no scaling” (or a similar option) on your printer, the design will print at approximately 7″ tall. You can enlarge or reduce it to suit your needs. If you’re looking around for other Christmas embroidery patterns, why not try these? If you’re itching to stitch something and need a design, you can find plenty of free hand embroidery patterns available right here on Needle ‘n Thread. Can you share a picture? It sounds so lovely. Thanks for this pattern, Mrs. Corbet. I’m especially liking the coloured in version. Holly and Joy again hangs in its place of honour on our living room wall. Thanks for all your wonderful patterns and stitching tips! The Christmas is a lovely seasonal pattern and there are lots of ways to embroider the tree. I love the filled in tree you could fill it with Fishbone stitch which would look great. I do hope you finish the Hungarian runner I would love to see it on your table for Christmas. 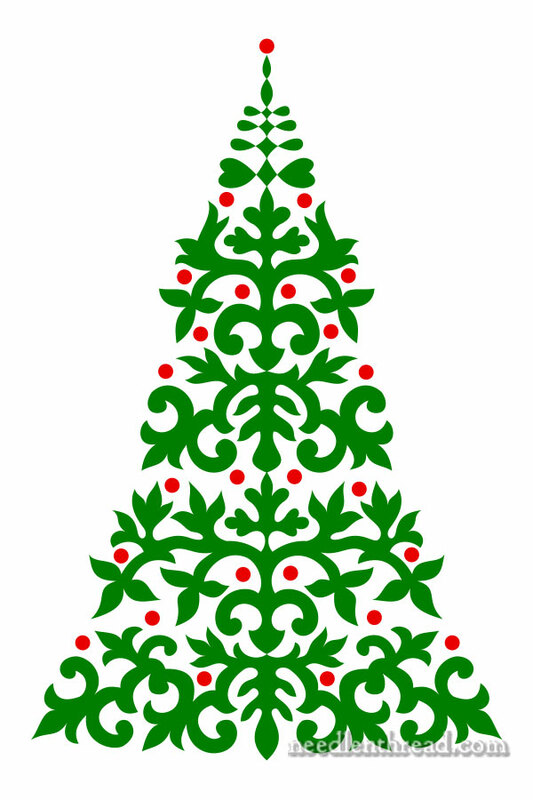 Thanks for sharing the Christmas tree pattern with us and for the other links to Christmas patterns so generous of you. Now you must get back to the Hungarian runner you can do it. Reproducible gingham graph paper included so you can also create your own designs! I just learned how to tambour. 🙂 This pattern is lovely! I stitched the Christmas Tree in chain stitch in two colours: grey and green in a quite special manner. I would like to send you a photo. Hi, Ingrid – you can use the contact form here on the website (https://www.needlenthread.com/contact). Thanks!